At 5am ET on Friday February 13th, unlucky SUN TV went off the air. Since the rumours of the impending demise broke on Thursday evening to now (and probably, a far-off-date in the future where you may be reading this from...or a day further into your future et cetra et cetra), there has been endless chortling from the left about how "FOX News North" failed. Right from the beginning, this shorthand dismissal from the Canadian left was off-kilter. Now that SUN TV is gone, Jay Currie checks in on why SUN TV failed -- in part, because it wasn't enough like FOX News. It was certainly a dissident voice in the wasteland of Canadian television. But it missed Marshall Mcluhan’s point about television being a cool media. Worse, it lacked the vision which has driven Fox to the top of the cable heap. Television is dying. Viewership is dropping, ad revenues are down. It’s dying because no one has time and no one wants to be talked at. Talked with, perhaps. My phone offers me a thousand and eleven news sources, raw video of events:the opinions I can develop myself. I love Ezra and Brian Lily. For five minutes at a time max. Which leaves 23 hours and change to do serious reporting, regional coverage, round tables, celebrity bs, culture, media, books and call ins. Plus serious business reporting when the market is open. None of that happened. Or,if it did, no one knew about it. The problem was, cable providers weren’t required to carry Sun News like they are more established, mainstream news channels. Sun pleaded with the bureaucrats in charge for “must carry” status, and lost. After that, its shutdown was only a matter of time. The mandatory carriages argument isn't wrong, per se, and it's certainly a strong contributing factor. But I can't help but acknowledge Currie's main point: the "mainstream" watches far-left programming like The Daily Show and doesn't notice its biases: they are often cruel, subtle, and sneaky. Ezra Levant, for all his strengths and weaknesses, isn't Ezra Klein: you don't have to ask what his biases and his basis is for the stories he covers and the interviews he does. Many of the SDA commenters are contributing their take on the loss, pointing out that a lot of conservatives weren't willing to pay extra money for the premium channels with SUN TV on it. That's I suppose a fair comparison, but as one of those people it's worth noting that there isn't any news on TV I watch or am interested in watching. For one, I'm much more a reader rather than a viewer: the TSN technique of posting article after article that are just a quick 3 line note followed by a video doesn't interest me at all. Even when it comes to sports I prefer the read. I don't watch TV news, or listen to newsradio, or podcasts, any of that jazz. As a speed reader (roughly 900 wpm) it's just far more efficient. So I'm not the target SUN TV viewer. Unfortunately, I think the typical TV news viewer in Canada just isn't a numerous enough demographic to spread out amongst the channels already available. A SDA commenter noted that CBC Newsworld often gets under 5,000 viewers, and it's a low-numbered channel on basic cable. Would SUN TV have survived if they bumped, say, CMT off of Channel 18? Or if it was on basic cable in the 100s range along with MTV and CTV News? Quite possibly. If it also got the CBC taxpayer monies? Yes, of course. As it was, sadly, it couldn't. And now the SUN TV news people along with all the supporting staff, from Ezra to an editor nobody knows about, are all unemployed. This brings us back to a few years ago, though, when Ezra's own business interest, the Western Standard, also failed. It came on the heels of Alberta Report, which also also failed. If memory serves, Ezra was writing for AR by the end as well. So is Ezra Levant a cancer for newsmedia wishing to survive? I'm sure every person who reads that will instantly shout out their opinion on it: if you're in a cafe reading this, please apologize to the person next to you. If you're a liberal, please grab a tissue and wipe your spittle off the monitor. So let's flashback to Ezra's lost Western Standard and what I wrote about its demise back in October 2007. I expressed incredulity that a right-wing magazine couldn't stay afloat even though nine different magazines about being an oil executive, numerous magazines about being a Red Indian, magazines about being an Alberta leftist, and magazines about being Alberta Game Wardens all surviving in the crowded magazine environment. Currie mentioned in his post that TV media was dying...but then, look at the channels that SUN TV News was combined with in their section of the Shaw dial. I've greyed out the channels that aren't in the same package as SUN: I get the two TSNs as part of my sports channel: those with the Shaw HD package get The Frame.† So let's just look at the specialty channels, the ones in the 166-177 change of your Shaw dial that you need to pay the specialty premium to get. 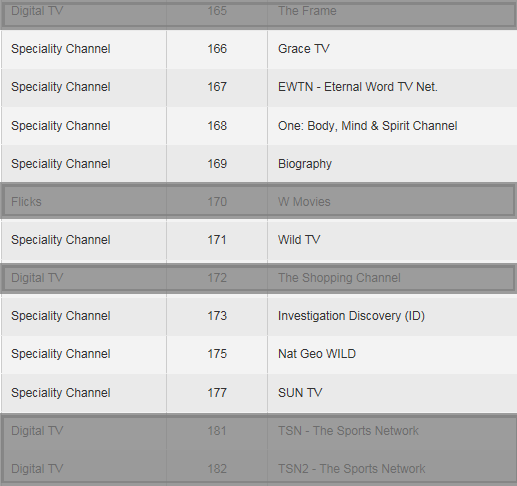 Grace TV is a Christian specialty station, as is EWTN (the latter is explicitly Catholic). One Body, Mind, Spirit, Love is devoted to yoga and alternative medicine. The Biography Channel includes documentaries and reality shows: they are connected vaguely to the U.S Biography Channel (now called FYI, which also has a Canadian version). Wild TV is dedicated to hunting, fishing, and the outdoors. We're getting closer to the SUN TV part of the dial now: on Channel 173 we have Investigation Discovery, originally the Canadian rebroadcaster of Court TV, which maintains that channel's interest in crime and justice programming. Finally, right next to SUN TV is "NatGeo Wild", which shows wildlife and nature programming similar to the US version of the channel. Finally we have SUN TV. What are the ratings for any of these networks? How many viewers do they get? Does it compare with SUN TV? That's not an easy question to answer, it seems. SUN TV made news when it only had 7,900 viewers. Does "Deadline: Crime with Tamron Hall" on Investigation Discovery Channel really do any better? And that's just a rebroadcast of an American TV show, so it's Canadian ratings aren't really that important anyways. For native Canadian programming, the ratings aren't always easy to discern. I tried asking the question on Twitter, and the answer seems to be that you need to pay a service a lot of money to get TV ratings in Canada. Not so in the States, where they get routinely published. It looks a lot like, in this case, viewership numbers for SUN were published by their competitors as less an action in journalism, and more a way to keep demand low for the competition. So the option question remains: SUN TV failed. But were their ratings really that bad? † The Frame is an advertising free service that just shows people's pictures, a program whose ratings can't be any better than SUN's were.